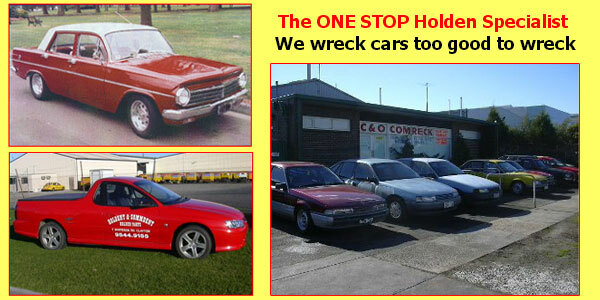 We Are Your One Stop Holden Shop! Are you looking for a wrecker who specialise in Holden’s? Holdent is the perfect wreckers for you. We offer a wide range of wrecker services including, new parts, repairs, scraps and conversions between manual and auto conversions in early Holden’s and later model commodores. At Holdent we pride ourselves on offering old fashioned services based on reliability, quality and affordability. We offer expert knowledge and wrecker’s service to ensure our Melbourne based customers receive the precise services you desire while working within a budget. No matter what the condition, we buy all old cars. At Holdent, we know Holden’s, wrecking and mechanical services, so if you are looking for a particular part or service, just contact our friendly and professional team. We are here to help! Our fully qualified team have been a part of the auto recycling industry since 1973 and during this time have developed a strong reputation for exceptional quality parts matched by unbeatable customer service. At Holdent we ensure that all of our work is completed within industry standards to guarantee longevity of the products and services provided. This dedication to the wreckers industry is why we are regarded as the professional wreckers servicing Melbourne. To arrange a consultation or to request a part, please contact Holdent today.